Dennistoun Community Council invite nominations to fill three vacancies. Do you want to be consulted on building developments and licesing issues in your area? Have a say on road safety, hospitals, transport, and the environment. Make a difference in your community! Nomination forms available for download here. Details on eligibility and the selection process can be downloaded here. Contact Lawrence O’Neill, community councils contact for North East Glasgow, via lawrence.oneill@glasgow.gov.uk or on 0141 287 4109 for more information. The Glasgow City Council Community Councils page information page is at glasgow.gov.uk/communitycouncils. Closing date is Friday, 2nd June 2017 at 12:00 noon. You need to be on the electoral register to vote in elections and referendums. 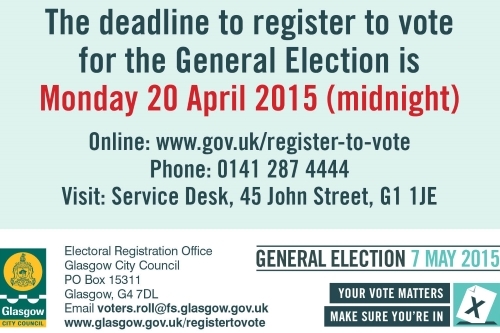 The deadline to register to vote in 4th May Council elections in Scotland is 17th April. Dennistoun Community Council invite nominations to fill seven vacancies. Do you want to be consulted on building developments and licensing issues in your area? Have a say on road safety, hospitals, transport, and the environment. Make a difference in your community! Closing date is Friday, 6th January 2017 at 12:00 noon. Reminders were recently sent out to more than 180,000 households in Glasgow as part of the Council’s annual household enquiry canvass to establish who is eligible to vote.